Zimmerman trial juror B37: Why did prosecutors let her on the Trayvon Martin jury? Why Did They Let Her on the Zimmerman Jury? The strange, strange case of juror B37. 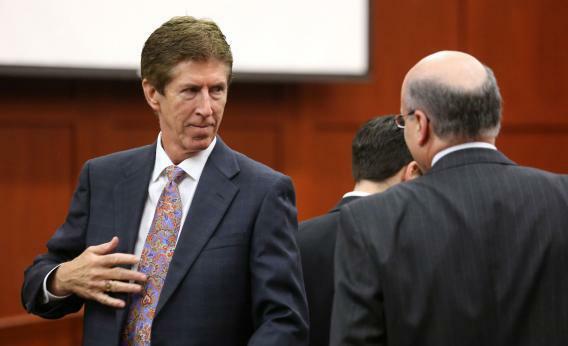 Defense attorney Mark O’Mara talks to prosecutor Bernie de la Rionda on the day of closing arguments in George Zimmerman’s trial. Less than two days after a Florida jury found George Zimmerman not guilty in the death of Trayvon Martin, juror B37, one of the six members of the anonymous panel, signed with a literary agent to shop her book about the trial. The news comes with a bonus video: juror B37’s entire voir dire captured on film and promoted Monday by Gawker. The process by which counsel on each side of the case interviews prospective jurors is revealing in all kinds of ways and a useful lesson in the strengths and weaknesses of the jury system. In the case of B37, it is also a master class on how to not know anything about something everyone else knows about. But the tape raises another question that should be debated in every trial advocacy class in America: What were the lawyers, especially the prosecutors, thinking when they seated her? Why didn’t prosecutors use one of their peremptory challenges to nix her? She’s contrarian, she raised serious ontological doubts about the nature of truth-seeking, and she was only ever truly animated on the subject of rescue birds. Both lawyers were visibly cowed by her. I asked several prosecutors, former prosecutors, and public defenders to watch the video and report on the red flags it raised for them. It’s not that juror B37 is a miscreant or a fool so much as a reflexive doubter that truth and facts are really knowable anymore. She speaks for the millions of Americans who believe that everyone is lying about something and the media lies about everything. The Internet, she explains, is for getting to the next level on Candy Crush Saga, not for getting information. And since everything is a lie, she doesn’t care enough to learn that the riots she believes to have happened did not. One wonders whether she would buy her own book about the truth behind the Zimmerman verdict. In his day, Twain was fretting about seating juries comprised solely of “desperadoes … beer-house politicians … bar-keepers and ranchmen who could not read.” Today, I worry about seating jurors who believe that since everyone is lying and everything is a lie, facts are for lining the birdcage.